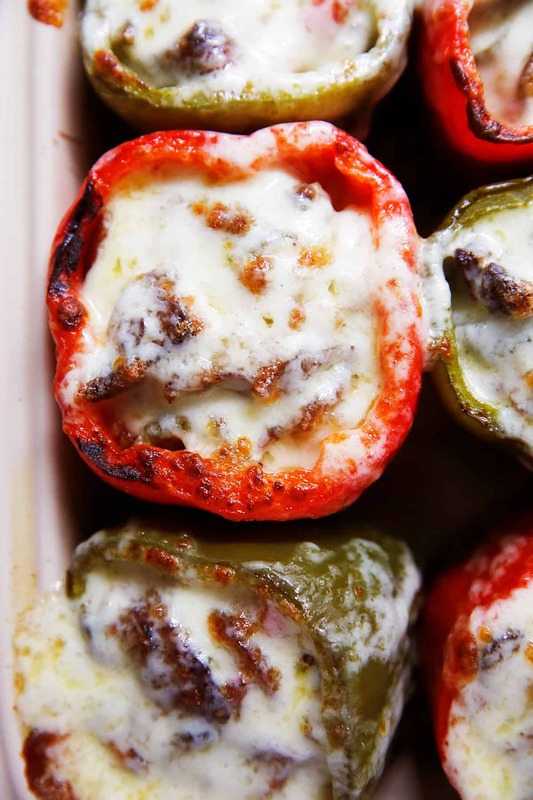 These dreamy Philly Cheesesteak Stuffed Peppers are SO GOOD! We use leftover rice and add in thinly sliced steak, mushrooms, peppers and of course, cheese. They’re a family friendly dinner that will leave everybody happy and are a great dish to prep ahead of time! After testing The BEST Rice Ever recipe a few weeks back, we were left with mounds of leftover rice to contend with. We could only eat it for dinner so much, so we set out to make a few leftover rice recipes. 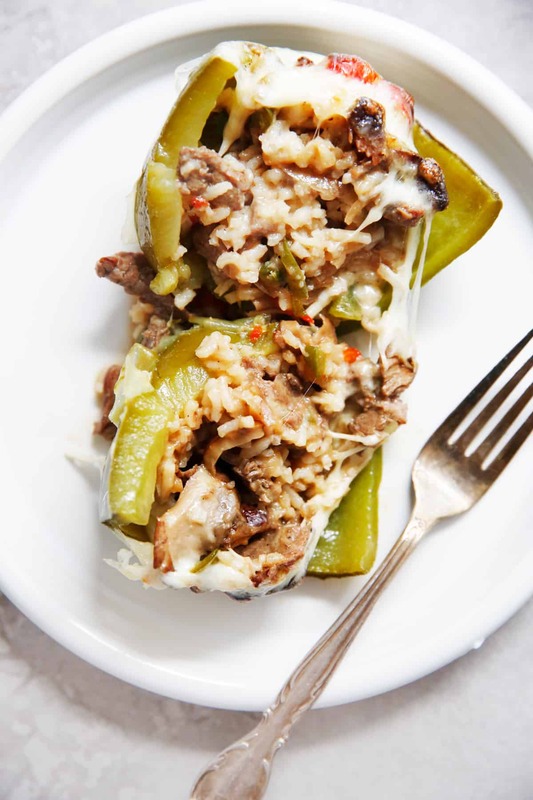 The first was this easy Breakfast Fried Rice recipe and then came along these Philly Cheesesteak Stuffed Peppers, and we’re so glad they did. 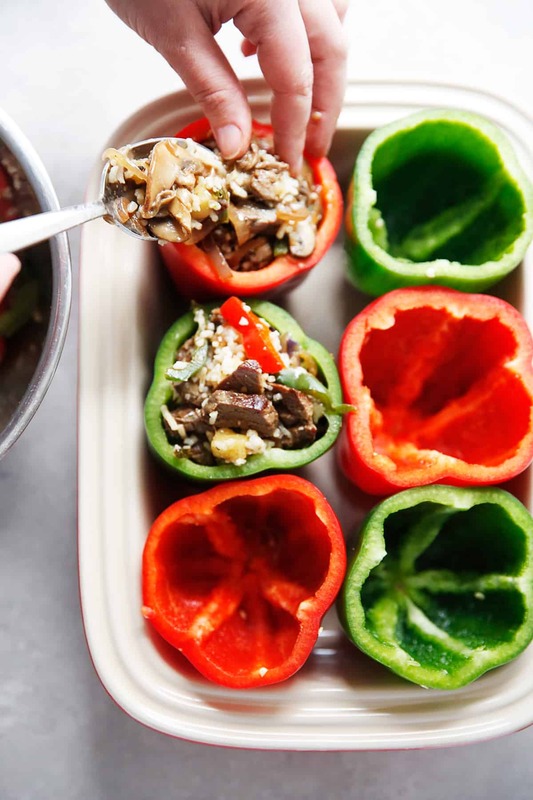 They are exactly what you think you are: bell peppers stuffed with thinly sliced steak, mushrooms, onions, cheese and leftover rice. They are also delicious. What we love about stuffed peppers is that while they take a few pre-cook steps of getting the meat and veggies soft, the bulk of the cooking time is hands-off in the oven, and they are a great make ahead dish. You can either prep the whole thing ahead of time and bake when ready, or you can cook the stuffed peppers entirely and use them for meal prep dinner or lunch. Do You Cook the Meat before Stuffing Peppers? Yes! As with most stuffed peppers recipes, everything is precooked before going into the stuffed peppers, except the bell peppers themselves. Can These be Made Low Carb? Yes! 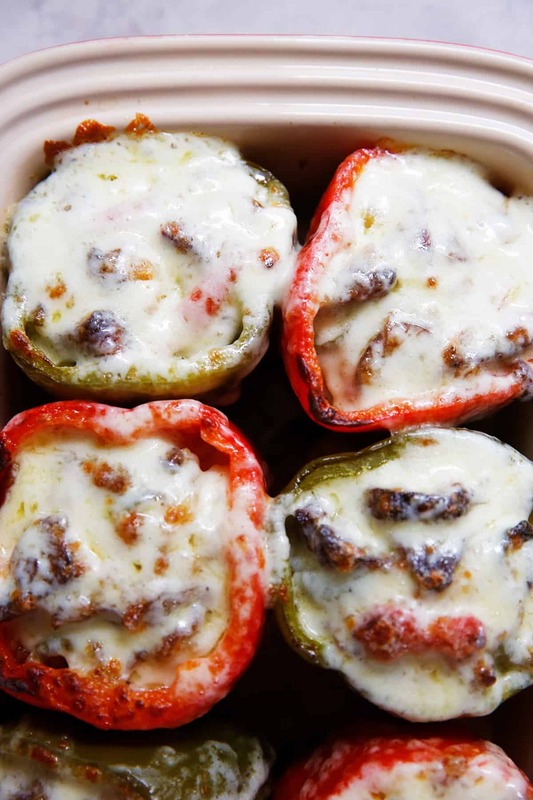 If you prefer to make these Philly cheesesteak stuffed peppers Keto friendly you can use uncooked cauliflower rice. Everything else in the recipe will stay the same. What Goes Good as a Side Dish with Stuffed Peppers? We feel that this stuffed bell peppers recipes is a whole meal in itself because it has the added rice to the filling, but if you were looking to serve it alongside something a salad would pair well! Prepare peppers: Remove the top 1” portion of the pepper, discard the stem and slice any usable pieces from the top portion and set aside. Scrape out the ribs and seeds and discard. Place peppers upright in a baking dish. Heat a large skillet over medium-high heat. When hot add oil and sear steak for 5 minutes, stirring until fully cooked through. Remove from pan and place in a large bowl. Reduce heat to medium and add mushrooms. Cook until all the liquid has evaporated, about 5-7 minutes. Add sliced onion and peppers, salt, pepper and garlic powder and cook until softened, about 10 minutes. Meanwhile to the bowl add the rice, and ¾ cup cheese. Once done add cooked veggies and mix until fully combined. Spoon mixture into prepared peppers. Pour 1 cup of water into the bottom of the baking dish. Cover with foil and bake for bake for 40 minutes, or until the peppers are tender. Remove from oven and preheat broiler. Divide cheese on top of peppers and put under broiler for 3 minutes until bubbly and brown. Serve immediately or cool completely and store for meal prep. If you can’t find shaved steak, you can use another boneless cut of steak like a ribeye, top sirloin or skirt steak. To get thin slices you can briefly freeze the steak, for about 15 minutes or so and slice against the grain. This Breakfast Fried Rice is made using only 4 ingredients and is a super easy meal to whip up anytime of day, not just in the morning! 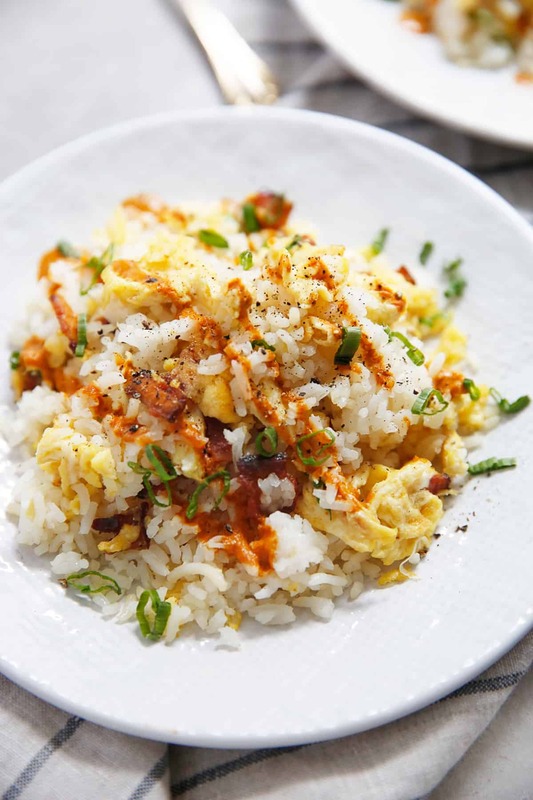 It takes the base of leftover rice and switches up the traditional fried rice by adding in the leftover breakfast staples of bacon and eggs. You can have it on the table from start to finish in less than 15 minutes which makes it a breakfast (or dinner) win! After testing and testing and testing our Best Rice Ever recipe a few weeks back we found ourselves with piles of rice in the test kitchen. 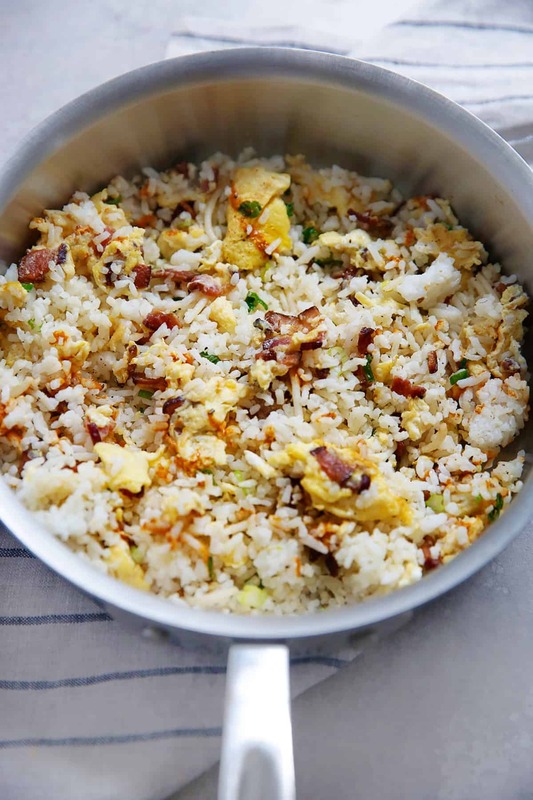 Not that we are complaining or anything, because it really is the best rice ever, but we knew we needed to put that rice to good use by testing a few new leftover rice recipes, and this Breakfast Fried Rice was one of them! 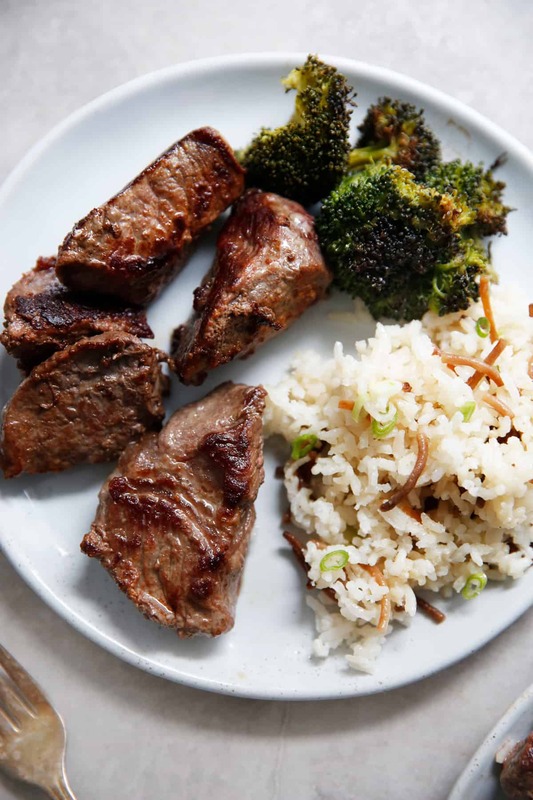 We love the idea of being able to make a double batch of something easy, like rice, when you are cooking dinner and then also being able to use up the leftovers again for a fresh meal later in the week. This Breakfast Fried Rice is the perfect example of this. This dish takes a total start to finish time to make of 15 minutes! On busy days (which they seem to be innumerable) this is the perfect breakfast, or lunch or dinner! 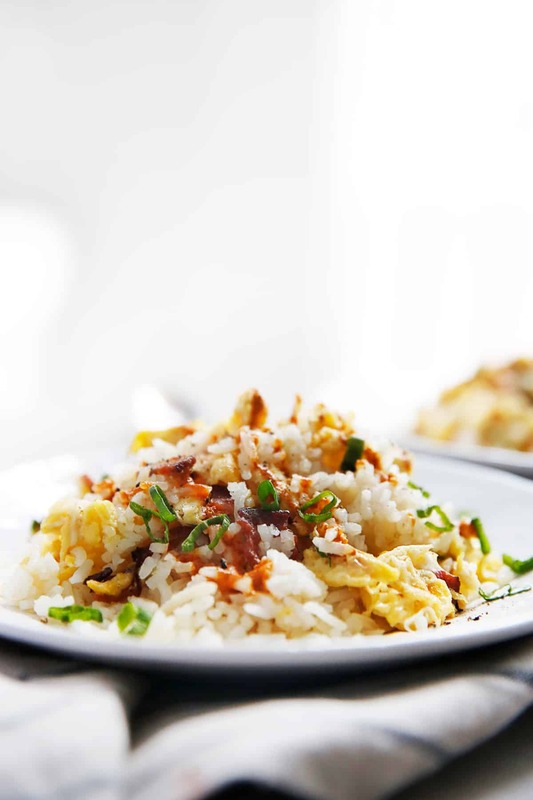 And likely you already have the ingredients on hand or in your freezer: bacon, eggs, rice and green onions. What is in a Breakfast Fried Rice? This is not the most traditional Asian-style type of fried rice, as we really wanted to keep the ingredient list as minimal as possible so there aren’t any add-ins like coconut aminos or other spices. Think of this as more of a breakfast stir fry! We wanted this to be a savory options for breakfast made with ingredients you likely had on hand that could be a satisfying meal. We limited it to bacon, eggs, green onions and leftover rice with optional hot sauce. What are some other options to add to Breakfast Fried Rice? In a nonstick skillet or well seasoned cast iron pan, cook bacon until crispy, about 6 minutes. Drain all but 1 tablespoon of bacon fat. Reserve leftover bacon fat for another use or discard. Lower heat to medium low and add scrambled eggs. Using a spatula move the eggs around the pan until they are fully cooked, about 2 minutes. Add rice and green onion and cook, breaking up the rice if needed with a spatula, until it is heated through about 3-5 minutes. Check the seasoning and adjust with additional salt and pepper if needed. Divide between two plates and garnish with hot sauce if using and serve immediately. If you are using seasoned leftover rice (like our recipe for the BEST RICE EVER) you will not need any additional salt because the rice and the bacon add salt to the dish already. 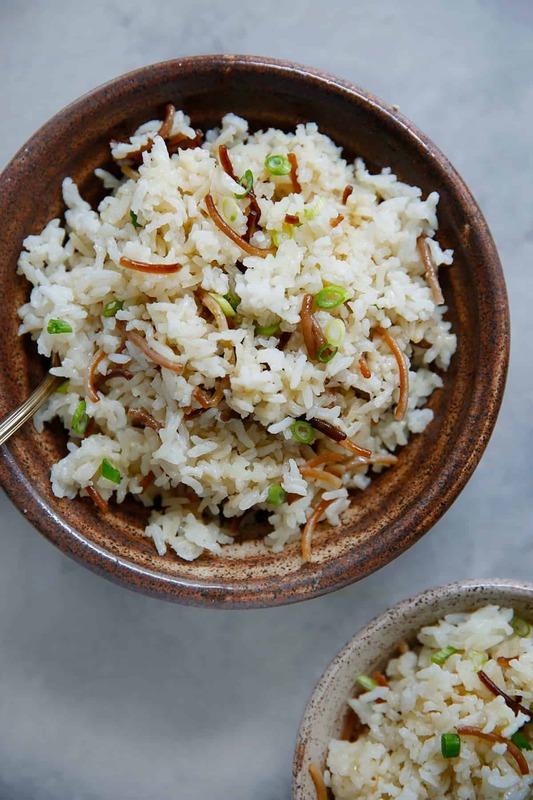 If you’ve ever thought rice was a plain-nothing-special side dish, this recipe on How to Make the Best Rice Ever (either in the stove top or instant pot) is for you! It’s the perfect recipe to pair with just about anything, is largely hands-off cooking time and is flavorful thanks to added onion, garlic and toasted noodles. 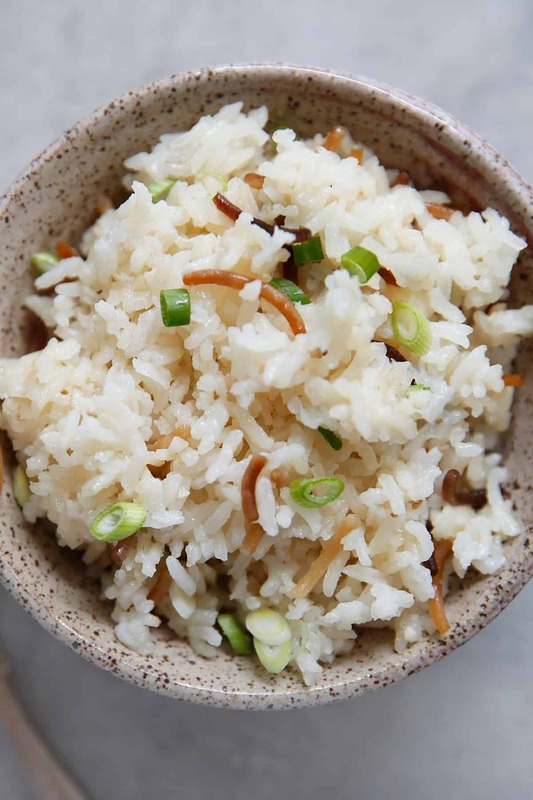 Our LCK Food Editor, Kelli Avila, shares how she came to love and cook this rice weekly. Want to know How to Make the Best Rice Ever? Kelli here, and I know I did after years of eating the rice my husband John, who hails from Colombia (where rice is a staple dish), has cooked for our family. Anybody who has ever eaten it has claimed that it was indeed the best rice they’ve ever had. His version of rice, also called arroz con fideos is similarly close to a what Americans would know as rice pilaf (or in Egypt is known as bil shareyah). It’s basically rice enhanced with onions, garlic and fried noodles. We use gluten-free spaghetti, and it’s quickly fried in oil that transforms it into something different with a nice toasted flavor. Over the last few weeks I’ve asked John to cook a few batches so I could watch how he made it. 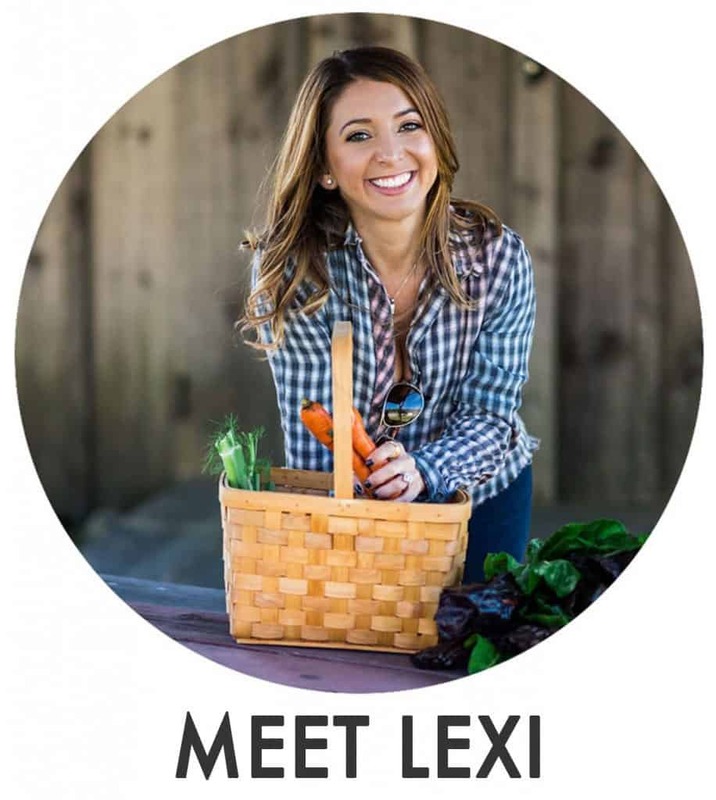 Lexi and I then got in the kitchen to test our own take on it, and are so happy with the results. There isn’t anything difficult to cook in this recipe, but it is all about building flavor with a few tricks to make the best rice ever. This dish is so good it could be eaten simply on it’s own, or in our family with two toddlers topped with a fried egg and happily eaten as dinner (and then remade into a new dish the next day such as a stir fry). You can also make a really large batch and freeze mini portions of it to take out as needed for a quick dinner side dish. And in the next few weeks we have some new amazing leftover rice recipes we can’t wait to share. Start with long grain white rice. Alternatively we also tested this with jasmine and basmati rice and it works similarly with a slightly different flavor profile. Do not use short grain white rice or brown rice for this recipe. Wash the rice REALLY well, like wash it more than you’ve ever washed rice before. This is probably the most critical step when making the best rice ever. Washing the rice rids it of excess starch that can make the final dish sticky. To wash, place the rice in a large bowl and fill it with cold water. Agitate the rice with your hands and then empty out the water. Fill it back up and repeat. You’ll do this several times until the water starts to get clearer, and then you can drain the rice and give it one more rinse until no cloudy runoff remains. Brown the noodles until it is almost burnt. The more you toast the noodles, the more flavor they will impart on the final dish. Just be careful because it can go from toasty, to burnt really fast. Mince the onions and garlic really well. The finer you can mince the aromatics the less bitter and harsh they come off in the final dish. The finally minced onions and garlic almost melt into the background of the dish instead of the rice very clearly having chunks of onion in it. Let the water boil down before you cook it. This recipe calls for boiling down the water until it has completely evaporated below the rice before you reduce the heat and cover. This deviates greatly with traditional recipes, but it results in a more pleasant texture in the final result. You’ll know you let the water boil down far enough once the little bubbles coming up through the rice disappear completely. Then you lower the heat and cover the rice for the remainder of the cooking. After the rice has finished cooking, uncover and let the heat remain on if you wish to get a crispy bottom. The crispy bottom is referred to as the pega. In my husband’s Colombian family everybody fights to get the pega because it’s so tasty. It’s basically a fried rice stuck to the bottom of the pot that is crunchy. What is the ratio of water to rice? 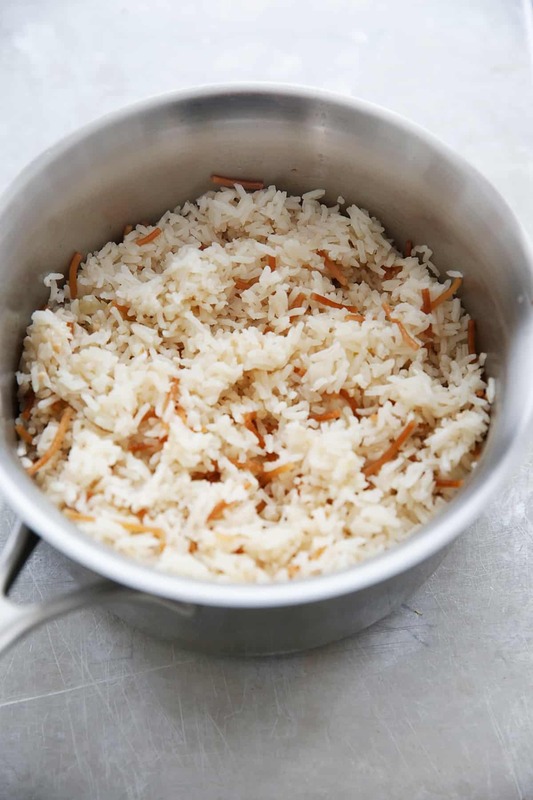 For long grain white rice on the stove top, the ratio is 1 cup of rice to 2 cups of water. For long grain white rice on in the Instant Pot the ratio is 1 cup of rice to 1 cup of water. What can you serve the Best Rice Ever with? Rinse the rice: Place rice in a large bowl and fill with cold water and move the rice around with your hands. Drain the rice and repeat this step until the water inside the bowl is clear. Heat a medium to large pot and add oil. Once hot at the dried pasta and toast, until the pasta is light brown. Reduce the heat to medium low and add the onion and garlic and cooking, stirring, for 3 minutes until just slightly beginning to soften. Add the rice, salt and water and turn heat to high. Bring to a boil and continue to cook until all the water has evaporated below the rice and the bubbles have disappeared, about 10 minutes. Cover and reduce temperature to the lowest heat and cook for 10 minutes. Once done, fluff with a fork and serve immediately. If you’d like to make a pega (crispy fried rice bottom) you can leave the rice with the low heat for an additional 10-15 minutes. We really love the flavor of the full 2 teaspoons of salt, but if you prefer you can reduce it slightly to about 1-1/2 teaspoons, though it will be a little more bland. Press saute on instant pot and and add oil. Once hot at the dried pasta and toast, until the pasta is light brown. Add onion and garlic and saute for 3 minutes until just slightly beginning to soften. Add the rice, salt and 2 cups of water (this amount is different than the remainder of the recipe) and press the rice button (or cook on manual pressure for 12 minutes). When done use the quick release function. Fluff with a fork and serve immediately or cool down to use for meal prep. The rice will keep for about 5 days in the refrigerator. Alternatively you can freeze in single serve portions to use for a quick weeknight dinner. To reheat place rice in a medium pot with 2 tablespoons of water and place on low heat with a cover. Cook for about 10 minutes until the rice is completely heated through and the water has been absorbed. 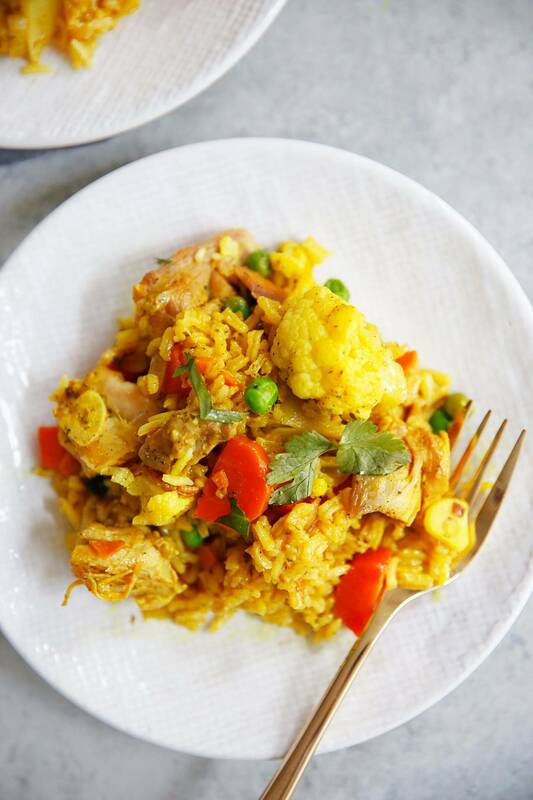 This One Pot Turmeric Chicken and Rice is a hearty, warm and comforting weeknight dinner option! It’s full of veggies and uses both fresh and dried turmeric. It is dairy-free and gluten-free and is bound to be a new, and easy, family favorite! 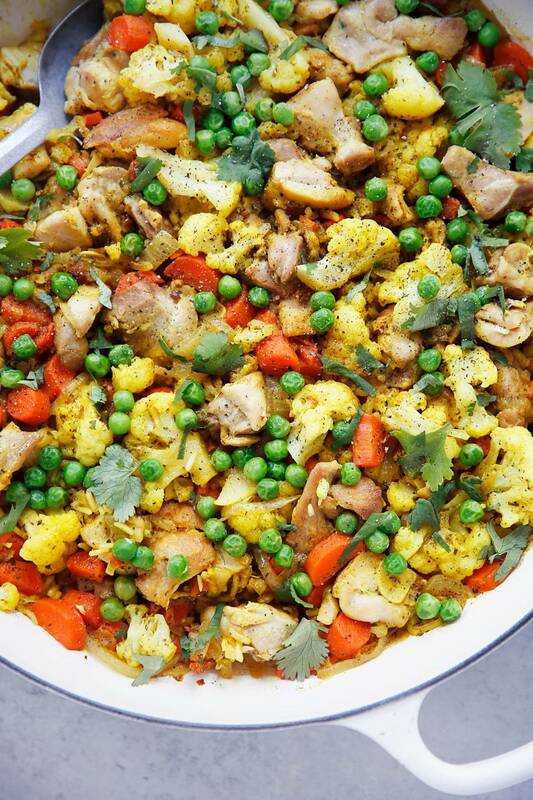 We love an easy-to-make and easy-to-love weeknight dinner and this One Pot Turmeric Chicken and Rice is one of them! A warm and comforting spiced chicken and rice dish that consists largely of unattended cooking and is made all in one pot for a simpler clean up! 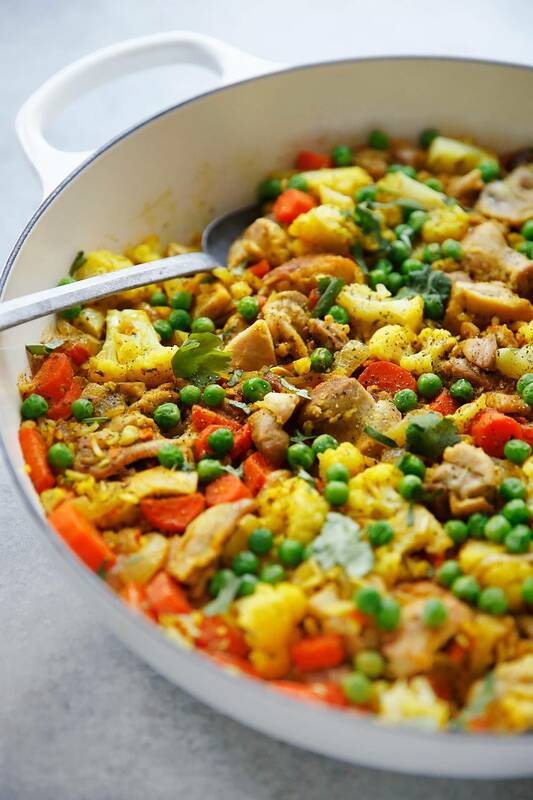 This dish uses both fresh and dried turmeric for an extra punch of flavor and has so many veggies packed in! We’ve talked quite a bit about turmeric on this site before because turmeric is a trendy food topic these days, but for good reason: it provides significant anti-inflammatory effects that can benefit a wide variety of health concerns! Curcumin, which is a nutrient found within turmeric, is a powerful anti-inflammatory. Chronic inflammation has been linked to a number of larger medical conditions such as diabetes, arthritis and heart disease. A natural and easy way to help keep inflammation down is through the foods you put in your body. 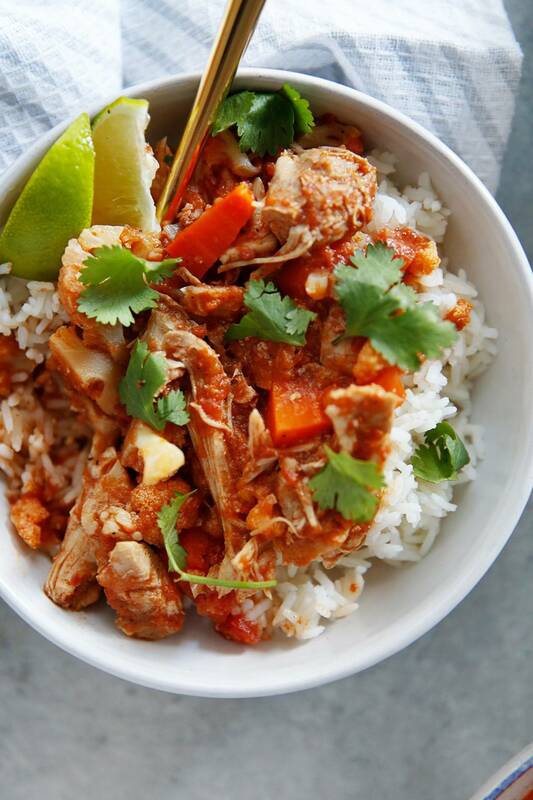 This One Pot Turmeric Chicken and Rice uses both fresh turmeric and dried turmeric. Now are we saying if you eat this rice all of your inflammation will go away? Nope! 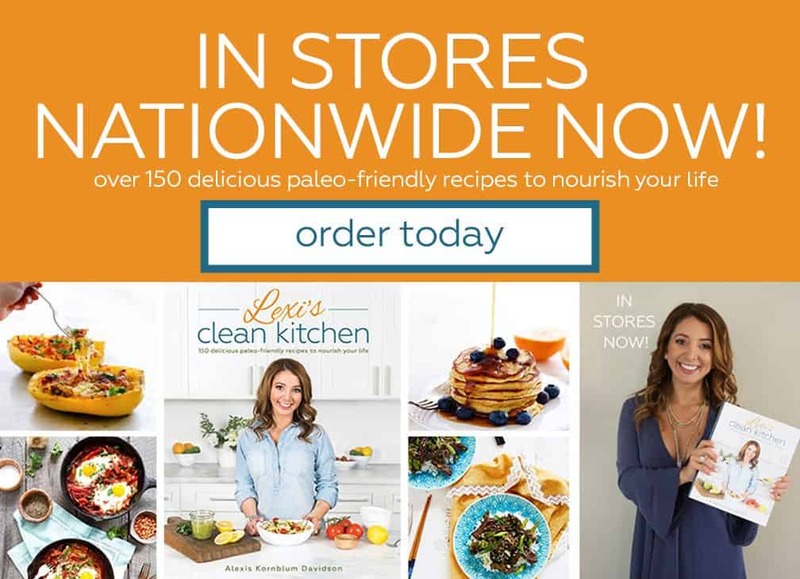 But we are big believers in using a whole and real food approach to healthy living and including as many nutrient dense ingredients in our every day meals is a good start. Where can you buy fresh turmeric? Almost any major grocery store will sell turmeric. Look for it in the section where they sell fresh ginger, and it looks similar! You don’t need to peel the thin skin off of fresh turmeric, but we prefer to especially if it isn’t organic. The easiest way to do this is to take a spoon and gently scrape off the skin. You can grate the turmeric with a microplane or finely mince it. Just be careful about where you prepare the turmeric because it will leave yellow everywhere it touches, including your hands! Heat a 12” heavy bottomed high-sided pan over medium-high heat. Once hot, add oil and chicken and cook until beginning to brown 5-7 minutes. Remove from pan and set aside. Add onions and carrots and cook until soft and translucent, 3-5 minutes. Add fresh turmeric, garlic and all spices and toast for 30 seconds. Add chicken stock and scrap up any browned bits. Add rice, cauliflower and the chicken and stir to combine. Make sure the mixture is spread evenly in the pan and the veggies and chicken are pushed into the liquid as much as possible. Let mixture come up to a boil, then cover with a tight fitting lid, and lower the heat to medium-low. Shut off heat, quickly remove the cover and sprinkle ½ cup peas over the top. Close the lid and let steam for 5 minutes. Notes: The cooking times can vary with this recipe depending on the brand of rice you use, how high your heat is on your stove and how heavy your pot is. Check to make sure the rice is fully cooked after the directed cooking time. If it is slightly undercooked, cook for an additional 5 minutes. 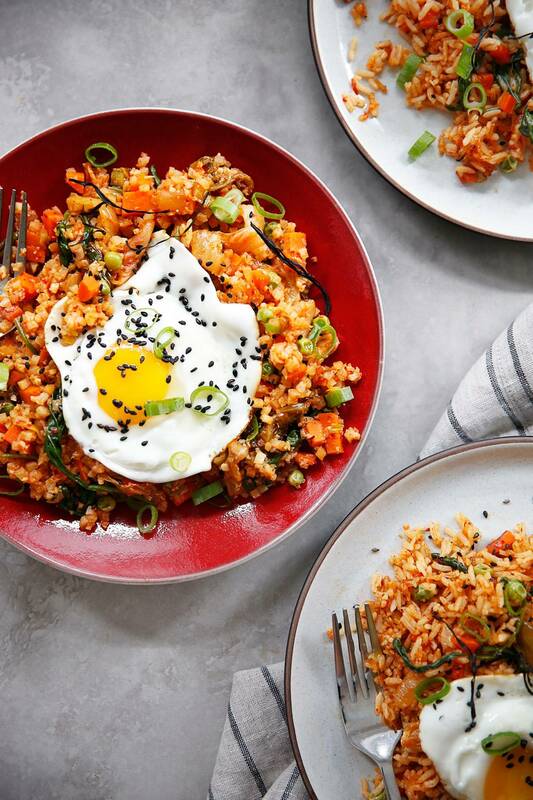 With Korean fermented cabbage as its base, this Kimchi Fried Rice is a great weeknight dinner when you want to spice it up a bit. It’s tangy and spicy and a great way to use up leftover rice or cauli-rice and veggies in your refrigerator. It is vegetarian, paleo friendly (with cauli-rice) and ready in under 30 minutes. With the busy holiday season upon us we thought it was time to make a quick and easy weeknight dinner that is also SUPER DELICIOUS and fun. 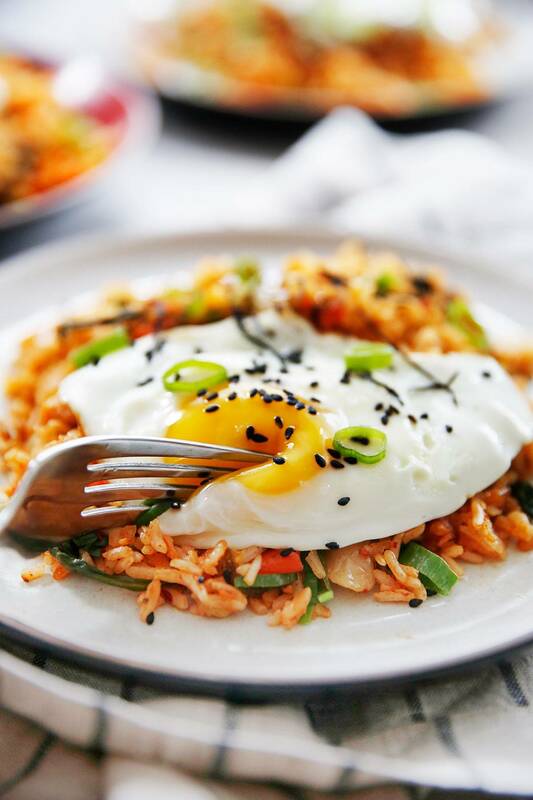 And we love a good fried rice here at LCK, and this Kimchi Fried Rice is no exception! 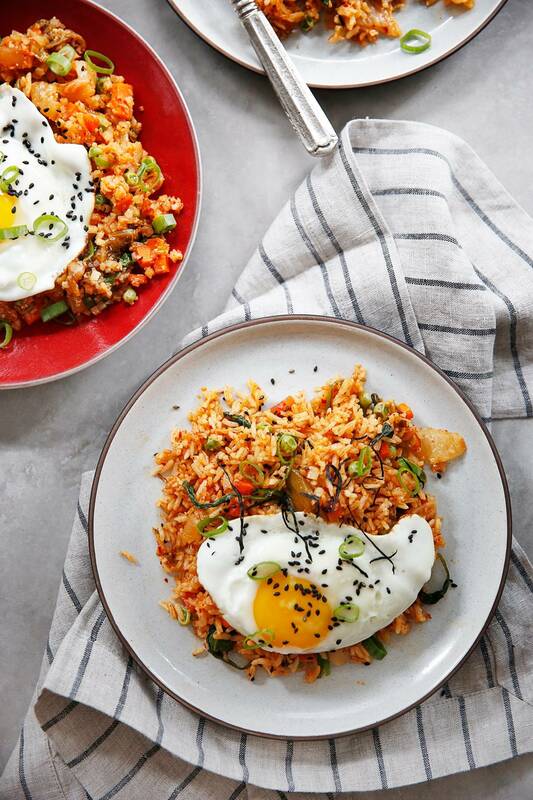 I almost always have Kimchi hanging around in my fridge (it lasts nearly forever) which makes it the perfect base to add to a fried rice that uses primarily pantry items. It’s super flavorful and we’ve included directions to make this with white rice or cauli-rice. In short kimchi is fermented vegetables! It is native of Korean cuisine and can range from spicy to mild depending on what brand you are buying (or making, if you’re feeling adventurous). Aside from being delicious Kimchi is a nutrient dense food but probably what makes me most excited about it is the naturally occurring probiotic strains that occur during fermentation. This is a great food to eat if you’re in the process of healing your gut or you want to have healthier digestive functions. What type of kimchi should I buy? A good kimchi will bring a balance of salty, sour and spicy flavor while holding a nice crunch to it. We’re partial to kimchi made from cabbage, but really the most important thing is to buy a kimchi that has only natural ingredients added to it. In other words, if you can’t pronounce or clearly recognize anything on the ingredients label, skip it! Make sure your pan is nice and hot! We like to use a cast iron skillet for this, which retains heat nicely! But if you have a wok feel free to use that. Have all ingredients ready and prepped before you begin cooking! Use a high heat oil, like avocado oil. Always top it with a fried egg! Heat a large skillet over medium heat and add oil. Once hot add mushrooms and cook until liquid has evaporated, about 5 minutes. Add the white part of diced scallions (reserve green for garnish) and carrots and cook until beginning to soften, about 5 minutes. Add in garlic and cook for an additional 30 seconds. Add sesame oil and rice and cook until heated through, about 3 minutes. Add kimchi, frozen peas and chili paste and heat through, about 3 minutes. Make a well in the center and pour in the scrambled egg. Cook until the egg has almost set and then move it around to scramble. Shut off heat and add baby spinach and coconut amino and stir until the baby spinach has wilted. Taste and add salt, about 1/2 teaspoon. Top with optional sesame seeds, nori strips and a fried egg and serve immediately. You can make this instead with cauli-rice by substituting 4 cups fresh cauli-rice for the 3 cups white rice in the recipe. Don't have leftover cooled rice? We tested this with frozen fully cooked white rice too! It was slightly more wet, but definitely a useful substitution when you want to make this but don't have leftover rice. This Instant Pot Chicken Tikka Masala is a great short-cut to a flavorful weeknight dinner! This delicious dinner uses the pot in pot cooking method, which means cooking the dish *and* the rice all together right in the pressure cooker! This gluten and dairy free dish also reheats well for meal prep and is a great addition to your Instant Pot repertoire! This popular Indian dish is bright, rich and creamy and comes from my friend Megan’s new cookbook: The Fresh & Healthy Instant Pot Cookbook. This dish is typically made with heavy cream and few vegetables, so Megan has given it a nutrient upgrade with more than a pound of cauliflower and carrots. The resulting meal may not be quite as authentic, but we just love how the vegetables become nearly undetectable in this rich sauce. Serve it with naan (if you tolerate), and use coconut milk to give it a dairy-free creaminess, but you could leave it out for less fat and a richer tomato flavor! This recipe uses the pot in pot method of cooking two different meal components in the Instant Pot at the same time. It was our first time using the PIP feature and we’re glad we took the plunge, thanks to Detoxinista, because it’s a game changer. What is Pot in Pot Cooking? 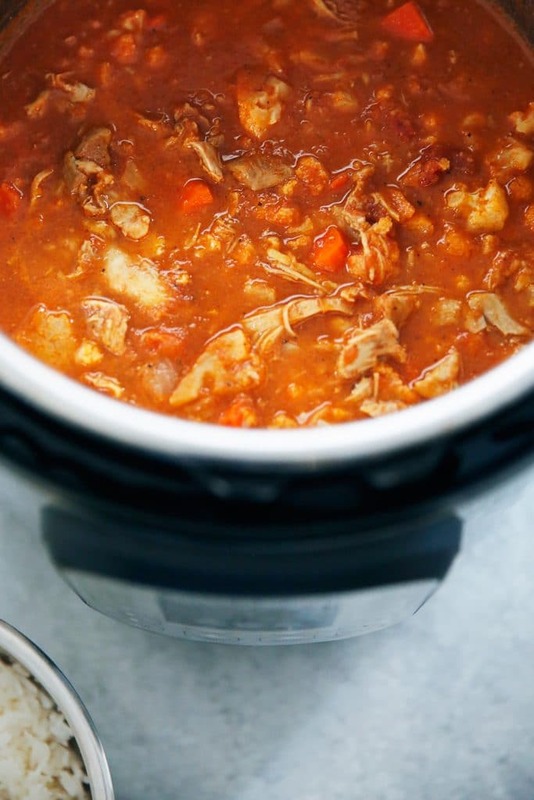 The ‘Pot in Pot’ method of cooking allows food to cook in a separate bowl that’s placed on a steam rack in the Instant Pot. Steam generated from liquid below the steam rack is used to build pressure and cook the food. Note: the container being used for PIP cooking must be placed on a rack, and not directly in the inner pot. Can you use Pyrex in an Instant Pot? Yep! Any pyrex is fine for it although stainless does have an advantage in that it wouldn’t require extra time. Anytime you use glass, pyrex, ceramic or any other heat absorbent material for “pot in pot” cooking, add about 5 minutes to the time under pressure! 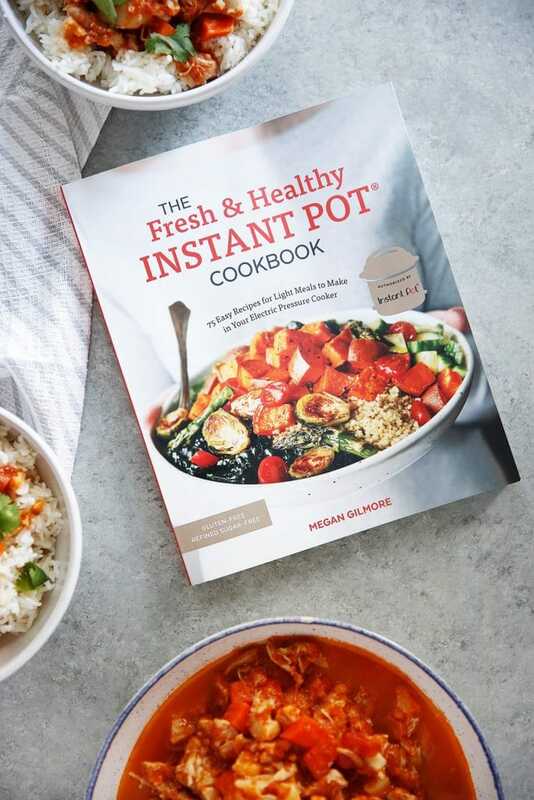 I was so excited to get Megan’s new cookbook, The Fresh & Healthy Instant Pot Cookbook! For starters, you know I LOVE my Instant Pot! Secondly, I adore Megan and all of her recipes, so I knew it would be a total winner of a cookbook. You can check it out and grab a copy here! What I love about this book? For starters, there are gluten-free options for each recipe, and all recipes are free of refined sugar and many of the most common food allergens, yet don’t scrimp on flavor!! Some dishes I cannot wait to make: Korean Chicken Bowls, Eggplant Parmesan Bake, Peanut Butter Crunch Granola Bars, Flourless Banana Oat Bread, and One-Pot Chocolate Cake and Frosting!! Oven safe bowl/container made of stainless steel, oven-safe glass, or ceramic/porcelain. The container shouldn’t touch the walls of the inner pot and should allow the Instant Pot lid to be closed easily! Which Instant Pot to get? I love my 6 qt. Duo. If you’re often cooking for more than 4 people, I’d go for the 8 qt. 1. Combine the onion, tomatoes with their juices, garam masala, cumin, coriander, paprika, cinnamon, ginger, cayenne, and maple syrup in the Instant Pot and use an immersion blender to blend until smooth. (Alternatively, place the ingredients in a blender and blend until smooth, then pour the sauce into the pot.) Place the chicken on top of the sauce and season it with the salt. 2. Arrange a 2.5-inch trivet (I bought mine in this set) over the chicken and place a 7-inch oven-safe bowl on top. Add the rice and water to the bowl. Secure the lid and move the steam release valve to Sealing. Select Manual or Pressure Cook to cook on high pressure for 12 minutes. When the cooking cycle is complete, immediately move the steam release valve to Venting to quickly release the steam pressure. When the floating valve drops, remove the lid. 3. Use oven mitts to lift the trivet and the bowl of cooked rice out of the pot. Fluff the rice with a fork. Use tongs to transfer the cooked chicken to a cutting board. Add the cauliflower and carrots to the sauce. Secure the lid and move the steam release valve to Sealing. Select Manual/Pressure Cook to cook on high pressure for 1 minute. When the cooking cycle is complete, immediately move the steam release valve to Venting to quickly release the steam pressure. When the floating valve drops, remove the lid. 4. Cut the chicken into bite-sized pieces and stir them into the sauce. Stir in the coconut milk, then taste and adjust the seasonings as needed. Serve warm over the rice. Store leftovers in an airtight container in the fridge for 3 or 4 days. Make it Vegan: Omit the chicken and instead add 3 cups cooked chickpeas or two 15-ounce cans rinsed and drained chickpeas. Decrease the salt to 1 teaspoon and cook on high pressure for only 4 minutes. Let the pressure naturally release for 10 minutes to finish cooking the rice, then add the cauliflower and carrots as instructed. 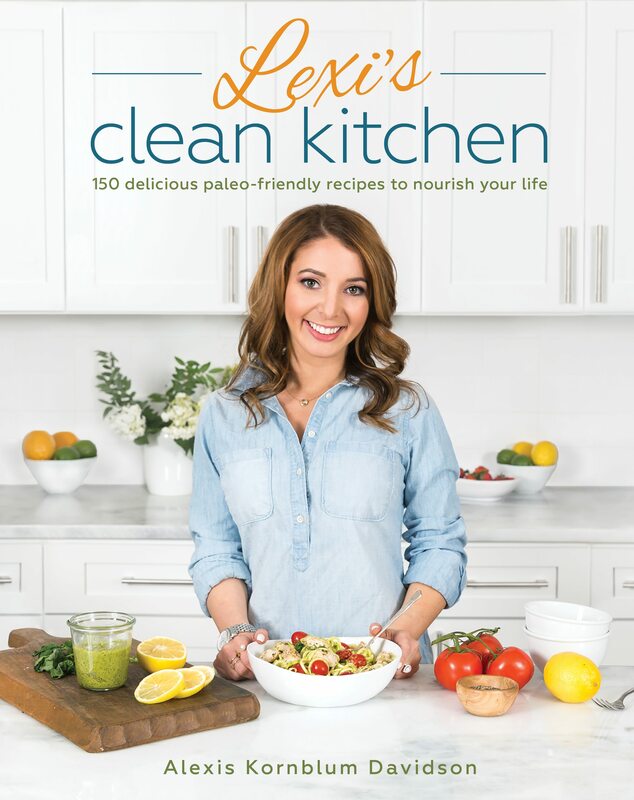 Author Notes: "I first used Pomi strained tomatoes instead of “diced” ones, which is AMAZING, but that product is hard to find and BURNS in the 8-quart pot for some reason. So, I went with the diced option because it has enough liquid to bring the 8-quart to pressure (I tested all the recipes in both size pots) but at the end you might want to use the Sauté button to simmer off the extra juices!"